NSO-CNA Leadership Academy offers educational programmes on personal and organizational development in education: School Leadership and Educational Management. In the Netherlands we offer two NVAO accredited Master Programmes for school leaders and a wide range of (tailor-made) trainings. Our international cooperation and capacity building include partners like Ministries of education, Universities, School boards and Education Management Development Organizations (EMDO’s). The international work is fully embedded in our organization and working tradition for over 25 years. NSO is partner in the European Education Policy Network (EEPN) on the professional development of teachers and school leaders. Also NSO-CNA organizes Communities of Practice on School leadership in Urban Education together with the cities of Amsterdam, Oslo and Berlin. 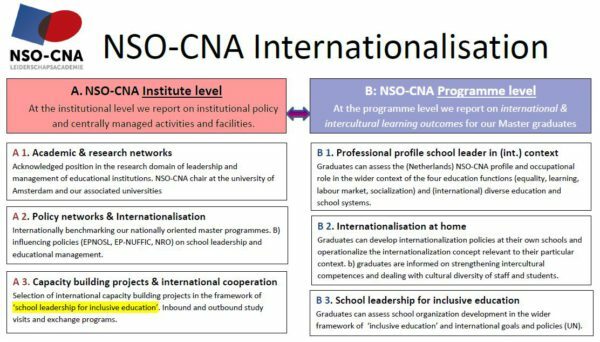 Regarding internationalisation we distinguish between our NSO-CNA activity and outcome on institute level ( partners and beneficiaries) and on Master Programme level (our students). Contact: Are you interested in our work or do you want more information on cooperation possibilities or exchange programmes contact NSO-CNA International office: Frans A. Grobbe (f.grobbe@nso-cna.nl).